The mad rush to the first day of school is in high gear. Sticking to a consistent eating plan is hard when I get so busy, I don’t want to stop and eat. I would rather walk around with fruit or almonds in my hand. Or, let’s face it. I could eat bacon at any point of the day. Cooking Light is a fantastic source of recipes that are easily adaptable to the gluten-free needs of many people. This week, I was out of ideas for quick and easy dinners that will fuel me for the long days I’m putting in at school. We are doing a LOT of classroom moving and I’m on-the-go constantly with running and CrossFit. This recipe for Citrus Salmon and Garlic Broccoli was an instant favorite. Combine first 3 ingredients in a zip-top plastic bag; add salmon. Seal bag; marinate in refrigerator 30 minutes. Remove fillets from bag, and discard marinade. Place the fillets, skin sides down, in a shallow roasting pan coated with cooking spray. Heat the oil in a Dutch oven over medium-high heat. Add garlic, salt, and broccoli; sauté 5 minutes. Remove from heat; toss with vinegar. 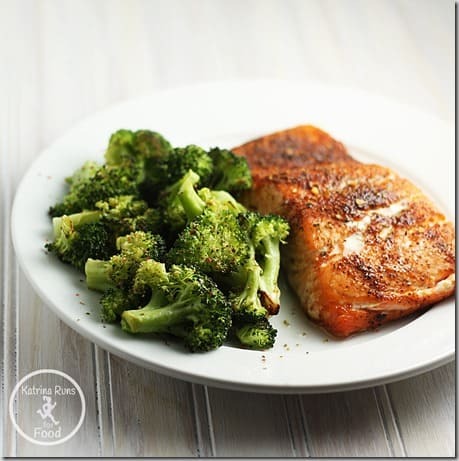 Arrange 2/3 cup broccoli mixture on each of 4 plates; add 1 salmon fillet.